"The biggest range of craft and specialty beers in London!" About: Since 2001, owner Kris has been collecting rare and specialty beers, wines and champagnes, and kindly opening up his treasures to us all through his shop. Don't be fooled by the name; this really is home to the biggest range of craft and other specialty beers you'll find anywhere in London with over 750 in stock at any one time; many you'll not be able to find anywhere else in London. If you're into micro-breweries, craft beer, the German Reinheitsgebot (that'll sort the beer fan wheat from the chaff!) or Belgium lambic beer! !, then Kris Wines absolutely HAS to be on your hit list. 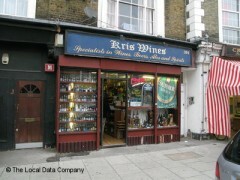 It may once have been all about wine here but this off license near Caledonian Road has since added one of the best selections of world beer in London to its shelves. There are hundreds of different brews from Denmark’s Evil Twin Brewing to New Zealand’s 8 Wired Brewing. The choice is insane.